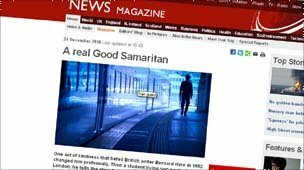 Our recent story of an act of kindness that befell British writer Bernard Hare, changing him profoundly, inspired dozens of readers to share their own experiences. 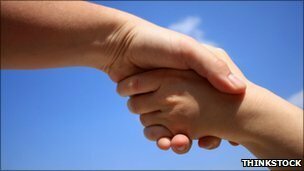 Here, 10 readers share their own uplifting tales of how their own Good Samaritan helped them out. They reveal how the sudden intervention of a complete stranger can transform one's life for the better - and even save it. I was on holiday in Cornwall in August when, while walking in a car park with a friend, I felt really weird. I was having a cardiac arrest. I literally collapsed and died, there and then on the tarmac, age 47. As my friend was trying to figure out what was happening, a stranger driving out of the car park stopped, having seen me lying on the ground, and asked my friend if I was OK. The stranger and his passenger got out of the car and came over to where I was lying. They immediately realised what had happened and took over. They were both consultants from Plymouth's A&E Department at Derriford Hospital. The driver happened to have the only piece of equipment that could bring me back to life - a portable defibrillator - in his car. After three-and-a-half minutes of being dead, he had me conscious and I was immediately airlifted to Treliske hospital. I later learnt from my consultant at Truro that he rang the hospital most days to check on my recovery. Apparently, my chances of surviving without the intervention of this stranger and his particular piece of equipment was nil. Since returning home to Bristol I tracked him down and had an, obviously emotional, chat with him by phone. It turns out he is also the chairman of a South West charity raising money to provide life-saving equipment to volunteers, hence why he had a defibrillator in his car. This incident with a stranger didn't just change my life - it gave me my life. Now I'm also hoping to "pass it down the line". I received a telegram from India informing me that my mother had died suddenly in March 1967. I was 22 years old and had lost my father two years earlier. My husband and I were desperate to fly to Bombay and find out what had happened, as my mother had been healthy and well when she left England only a few days prior to her death. We tried to get airline tickets only to find that Julia, my baby, wasn't on anyone's passport. It meant we couldn't take her. I was desperate to go but couldn't leave the baby behind. I phoned the Foreign Office and got through to an official who was sympathetic but explained it was the weekend and nothing could be done until Monday. I begged him to help me and, to my astonishment, he agreed to help me. We rendezvoused at Heathrow airport and he put a stamp in my passport, making Julia legal. I hardly thanked him, I was still crying so hard. But this kind man had given me his weekend time and possibly bent the rules to help. I am still enormously grateful to my Good Samaritan. My father parked the car at the top of a steep hill when I was about six years old and walked down to a pub. I was in the passenger seat alone, before seatbelts existed. The car started rolling down the hill towards the pub, a main road and a huge wall, picking up speed. I expected to be killed. Miraculously, a man leapt from a vehicle into my dad's car and managed to stop it at the bottom off the hill, just a few inches from the wall. Dad didn't return until he was drunk, as usual, by which time the man had taken me home, but no-one was in. I always wondered who that man was who saved my life, then disappeared, 57 years ago. When I was 18, 27 years ago, I was on my way home from college carrying heavy bags of books when I slipped on some black ice. I banged my face straight on the cement bus stop post and chunks of glass from my glasses went into my right eye. The bus driver waited for me to board the bus. My face felt numb as blood trickled down my face onto the floor of the bus. I had no idea that my face was so badly cut and that I was on the verge of losing an eye if I did not get immediate medical attention. All the passengers on the bus were marvellous. Some of them handed me tissues. A lady on the bus came over to ask me if I was OK. Feeling rather embarrassed, I told her that I was fine. The bus driver terminated the bus at the next bus stop and radioed for an ambulance for me. The lady who asked me if I was OK went to the hospital with me and stayed with me until a family member came to get me. The bus driver rang the hospital and enquired about my condition. I am pleased to say that after intensive surgery and visits to Moorfield Eye Hospital I still have sight in my right eye. I just have a large scar to remind me. Sadly, my mother and I never did get to thank the Good Samaritan lady who had left me her name, address and telephone number. When we went round to thank her, she had already emigrated to Canada. I will always be grateful to Mrs O'Connor, wherever she is. One cold Sunday morning in 1965, when I was a theological student in Leeds and preaching 30 miles north of my college, my fiancee and I were travelling on my Honda 90. We were inadequately attired for a particularly cold morning. Somewhere up the A1 the bike ran out of petrol. We stood at the side of road shaking with cold and not sure what to do. Suddenly a passing car stopped just past us. The driver got out, popped his boot, took out a gallon can of petrol and poured it in my tank without saying a single word. He put the tank back in his boot and drove off. We stood there open-mouthed and stunned with gratitude. To this day we're tempted to think it was an angel. My friend and I headed over to Toronto and hired a car. We didn't book any accommodation as it was at the beginning of September and we thought it would be easy to find a hotel or hostel. We had been driving for five hours when the weather changed and it looked like a thunderstorm was coming. We got lost and were both exhausted when I saw a lady parking her car. I stopped and asked if she knew a lodge or hotel nearby. She said there was a lodge down the road but it would be closed. The lovely old lady looked at us - we must have had a really desperate look at our faces - and said: "Why don't you girls just stay at me and my husband's house for a night. We'll show you wherever you guys want to go and I'll cook you dinner." We ended up taking one of their boats to a little island in Lake Muskoka, where her husband, Clint, was just working on his boat. Both Carol and Clint were lovely. We slept in the bunk beds they built for their kids and grandchildren, they filled up the fridge with beer and cooked for us. We stayed for three nights in total and also met their friends. Those days were the best part of our three-week trip. They were two angels on an island. We were glad we got lost and met them. Years ago, when my then husband had been made redundant, I was pregnant with our second child and our daughter was only 10 months old. We were on benefits for the first time in our lives - even the baby milk was free - and our mortgage was being paid. Our pride was in our boots. A free supermarket bus used to drop off people outside our house and a lady got off the bus and came down our drive with two bags of shopping for us. She said she hoped I didn't mind but she'd heard of our troubles from some of the neighbours and had bought us a chicken, fresh cream, cakes and biscuits to help us out. I stood on the doorstep and cried at her kindness. I offered to pay but she wouldn't hear of it and said I'd have the opportunity to do the same for someone else one day when our fortunes took a turn for the better. I've done the same more than once and I'll never forget the stranger who knocked on my door with free shopping for me and my family in our time of need. In 1993, at a football game between Millwall and Portsmouth, I was drunk as usual. A policewoman was ushering us Portsmouth fans back towards the station when she saw me staggering and went to arrest me for being drunk. Seeing that I was not disorderly, she asked if I was OK. I said: "Yes, fine, just having a good time." She said it didn't look like much fun and asked whether I drank often. I replied: "Every day" and cried. She held my arm gently and told me to stop drinking. Life was too good to drink every day, she told me. She said I looked too good to be a drunk and was too good a man to die young. The policewoman looked at me with pity and a kindness that made me cry again and think. Two months or so later I got sober. I haven't had a drink in 17 years. I was living in South Korea a few years back when I had to leave the country and return again, due to visa restrictions. My destination was the port town of Fukuoka, in Japan. I had plenty of money in Korean currency which I intended to exchange into Japanese currency in order to get me through the evening. Little did I know, however, that it was a bank holiday in Japan and there was nowhere to change my money. With no local money, I had little choice but to walk from the terminal towards town while trying to work out what to do. Some hours and a few closed banks later, I heard two young European chatting in French and, with nothing to lose, asked if either spoke any English. They were Belgian students and, after hearing my predicament, offered to postpone meeting their friends to take me around the city in search of a currency exchange. They paid for my bus tickets and took me around several locations before finally finding me a hotel that would change my money. I offered them their money back plus some extra for drinks on their night out. They refused and insisted that they wanted nothing for the tickets, adding that I should join them and their friends if I wanted to buy them a drink. Hours later, after a fantastic night out, they ordered me a taxi and helped me get on my way. Their kindness still shocks me and inspires me to help others whenever I can. About 20 years ago I was driving back from Edinburgh late at night and nodded off at the wheel, taking my car into a field between Biggar and Dolphinton. Although I was uninjured, the car was a write-off. I made my way up to the road. Two cars passed me as I tried to wave them down, but the third stopped. The driver took me to Biggar - the opposite direction to the way he had been going - and the police took over. They got me checked out at the hospital, then drove me to Abington services. From there a Free Church minister on his way to Dumfries brought me all the way home to my door - well out of his way. Incidentally, the field I had fetched up in had contained sheep and I was well-covered in sheep manure. None of those kind people who got me home that night even mentioned it.